A duo from Nashville Tennessee that doesn’t fit the “Nashville stereo type” at all. In fact, import/export Pete “Sonic Boom” Kember (Spectrum / Spacemen 3) into the mix (he mixed it), and Nashville is turned inside out. Drums and Guitar and washes of feedback all make for a magnificent psych journey. I saw these guys live at the Austin Psychfest in 2013 and the sounds they made were pretty mesmerizing as I crested the banks of the Colorado River (the backdrop for the band), I was expecting a helluva lot more than just two dudes with one of them being on a very stripped down drum kit. Good news, they sound as good, if not better, live! On one side you’ve got the slow burner Sometimes You Just Are – and then the intensity level kicks it up about 10 klix more, then, back down and then again back up; a nice ride; Tricks of the Trade is a little meaner sounding and reminds me of a stripped down NYC NoWave act circa the late 80’s or early 90’s (something not to be messed with to say the least). 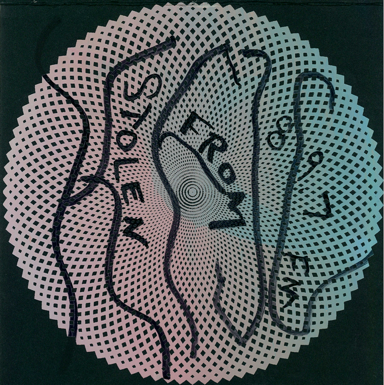 Last thing, making this quite a find in the KFJC library is that every cover on these limited edition 7″ are all unique (and we defaced it and fucked it all up as is the custom).